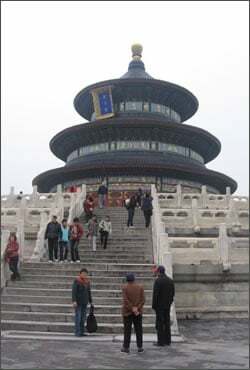 Life in Beijing, China, is never lonely, and certainly never dull, for Dini Freundlich of Chabad House Beijing China. She hasn’t the time. 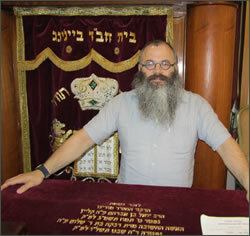 Dini and her husband Rabbi Shimon Freundlich have been serving the Jewish community in Beijing, China, since 2002. And on this particular day, in late fall, Dini has just finished feeding several students, and is busy caring for their children while helping to edit a PowerPoint presentation for one of her husband’s upcoming lectures. “You see, I never have time to be lonely,” she explains, handing me a cup of tea from her kitchen. “I mean, just take a look. Does this look lonely to you?” she asks, waving her hands at the seemingly countless number of people who seem to stream in and out of the Chabad House at a steady pace, periodically interrupting us to ask Dini a question. Indeed, there seemed to be no end of work to do. Simply watching the Freundlichs at work was exhausting. For the last eight years the Freundlichs have been working tirelessly to serve the Jewish community in Beijing, which includes 2,000 residents and thousands of tourists every year. The sheer magnitude of the amount of work that goes into the operation seems insurmountable. 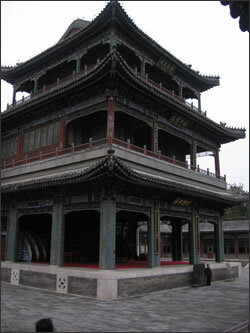 Some of what Chabad House Beijing offers includes: the Mei Tovah mikvah (opened in 2006), adult and children’s classes, Hebrew school, monthly women’s Rosh Chodesh groups, Bat and Bar Mitzvah classes, counseling services, and hotel reservations, as well as Shabbat and holiday services with meals. All of this has taken months and years of planning and hard work. Take the simple act of ensuring that the community has access to kosher food. In order to make this happen, a shochet (kosher butcher) must be brought to Beijing every three months. During that time, the shochet will slaughter an estimated 4,000 chickens and 1,000 grass-fed cows. The meat is then frozen and shipped to neighboring communities throughout China like the cities of Shanghai, Guangzhou, and Shenzhen. Additional kosher foods are specially shipped in from the United States and sold at the Chabad-run kosher grocery stores that sell popular American brands. Challahs and challah rolls are baked fresh every week by hand and supplied to local families as well. In addition, Dini also oversees a kosher restaurant, appropriately named “Dini’s Kosher Restaurant,” which serves two hundred meals a day and is fully staffed. Without these services, life in China for observant Jews would be incredibly difficult. While I could not help but be impressed by Dini’s tight shift, Rabbi Shimon Freundlich is just as busy. When not overseeing the daily upkeep of Chabad’s many responsibilities, he is traveling and raising money to expand its operations. In fact, it is a bit of a miracle I was able to meet with Rabbi Freundlich at all, given his busy travelling schedule. And had it not been for a series of serendipitous events, we might never have met. Weeks before arriving in Beijing, I had sent several emails to Freundlich that included an attached list of interview questions, that went unanswered. Out of sheer frustration, I had decided to visit him unannounced. As luck would have it, Freundlich had been out of the country for several days, but was scheduled to be back in Beijing on October 15, the day of my arrival. Of course, I had no way of knowing any of this except that, by sheer luck, Rabbi Freundlich happened to be on the same flight as me, a connecting flight from Seoul, South Korea, to Beijing that very morning. I had noticed an exhausted Freundlich as he boarded the plane, and had excitedly bombarded him with questions before he could find his seat, explaining that I had been trying to reach him for weeks, and was in fact on my way to see him. Freundlich didn’t seem to be the least bit surprised. Did this sort of thing happen to him often? “Could you stop by for an interview Sunday morning?” he asked calmly before taking his seat. He was leaving Beijing again that Sunday evening, he explained, but he could get me in at 11 AM for an interview before his flight left. And that is how I arranged an interview with Rabbi Freundlich. I caught Freundlich, an unassuming and quiet man, sandwiched between an adult lecture series and the final preparations for his flight out of Beijing that evening. Freundlich settled down to a brief interview where we discussed life for him and his family since coming to Beijing. “Organizing a minyan on the weekdays is difficult,” explains Freundlich. “Often there just are not enough people that come to Chabad on weekdays.” As for the impact on the children, “The social aspects of life in China were difficult for our kids. In fact, that was the most difficult adjustment for all of us,” explains Fruendlich. “As the children got older, they grew bored and in need of greater social support.” When that happened, he and his wife made the difficult decision of sending their older children out of the country to continue their educations. And while the social differences can be challenging for the whole family, Freundlich sees similarities between Chinese culture and Jewish culture. “We are both ancient cultures,” stresses Fruendlich, “we both share similar philosophies. Take for example the concept of Feng Shui,” he points out, “the idea that things in the home need to be placed in specific areas of the house to create a peaceful environment. The Code of Jewish Law discusses this.” Fruendlich also points out the importance of home and family in both the Chinese and Jewish cultures, with both emphasizing the importance of traditional values. And while there are distinct similarities between the Jewish and Chinese cultures, life for the Jews of China is still filled with many challenges that Chabad attempts to circumvent with its services. Some of these challenges can be as simple as the act of getting a kosher meal, while others involve maneuvering life in a city with few Jewish social activities. For many Jews living in Beijing, without these services, life can get fairly isolating and lonely. While Chabad House offers services to anyone in China with a foreign passport, the Chinese government does not consider Judaism to be one of its five officially recognized religions. 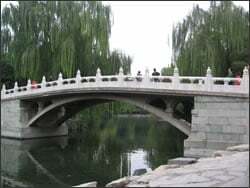 Neither does the Chinese government allow for conversions, due to its anti-proselytizing policies. Instead, perspective converts to Judaism must undergo conversion outside of the country. Still, Freundlich is quick to point out that the Chinese government has been very tolerant of Chabad’s activities, and that they have been well treated since coming to Beijing. 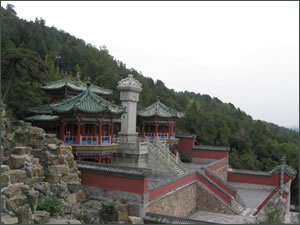 The issue of Jewish conversion in China has especially come to light in the last few years with the recent interest shown to a lost community of Jews in eastern China known as “the Jews of Kaifeng.” Thought to be a community of Jews living in China for hundreds of years, most of the original community is long gone, due to assimilation and emigration. However, some of descendents of the Kaifeng community have emigrated to Israel, where they have undergone Orthodox conversions they could not receive while living in China. Freundlich points out that the real purpose of Chabad in Beijing is to serve as a home away from home for Jews traveling and living in China. And you need not be observant in order to enjoy these services. Freundlich points out that the majority of the people that come to Chabad are not Orthodox Jews, but merely people wishing to benefit from the many Jewish services Chabad has to offer. Whether you visit Chabad House Beijing for the great food, classes, Shabbat meals, or simply the camaraderie of this distinctly Jewish environment, one can’t help but agree with Dini Freundlich: life at Chabad Beijing is certainly never dull or lonely. For more information about Chabad Beijing, check out their web site at ChabadBeijing.com. Dr. Whimsy Anderson, N.D., is a Naturopathic Doctor licensed in California. Her work has included extensive research on human adaptation, and on the roles that ancestry and environment play in determining optimum health and diet. Besides her own private practice, Dr. Anderson also works as a consulting practitioner at Pharmaca Intergrative Pharmacy in Brentwood. Dini and Shimon have done a so wonderful job that we felt in Family with them and this feeling is shared by everyone lived or is living in Beijing. Thank you This is a great article, very interesting! Grass Feed Beef Nice story. Memorable Shabbosim in Beijing thanks for bringing back wonderful memories of receiving the amazing hospitality of Reb Shimon and Dini and Beijing Shabbosim. Truly lifesaving, on so many levels. I'm thrilled to hear that the mikveh got built and wishing everyone continued hatzlacha and bracha in all.